If you can't make a whole New York scrapbook from 3 days in the 'Big Apple' - then you weren't trying hard enough! The only challenge I had in New York was being able to fit the images into a frame - I got the bottom half of some buildings and the top half of the rest! I must confess that when I saw this 'Creative Imaginations' 12 x 12, with this amazing design - Danielle Johnson's 'Art Warehouse' - I took the easy option. Sometimes a paper is just so darned good I don't want to spoil it with my rudimentary design skills! Again, because of the detail in the paper design, I was reluctant to splash journaling cardstock all over it - so I just went with three journaling 'apples' with minimal words. It's true - I don't do heights. At the top of the Empire State I was skulking in that little shop up there - though I'd have drawn less attention to myself if I'd stopped whimpering. THEY DIDN'T BUILD NEW YORK WITHOUT A PLAN! 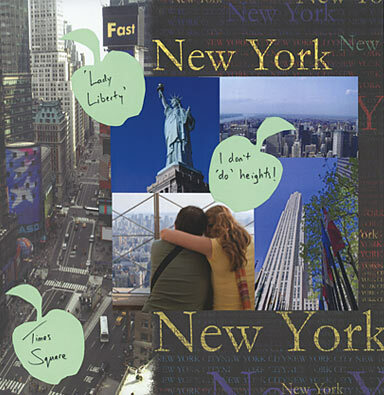 A New York Scrapbook can contain all sorts of themes within a theme. You could feature Central Park, Broadway, Times Square, South Street Seaport, yellow cabs, the Village, even Grand Central with it's ceiling laser show! My offering is little more than a taster - of sweet rather than bitter apples.